The heat and humidity was oppressive. My wife is the only volunteer that tends to the dogs at the pound on the weekends, and I help out when I'm not working. We know which dogs can mingle with who and allow them to play with each other. There are five in the group above who run and play till they are all tuckered out. trauma yesterday. 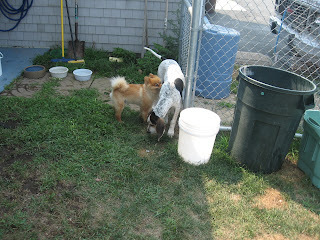 Everyone's favorite at the kennel "Brandy", the little brown dog, was attacked by a very large fox hound. 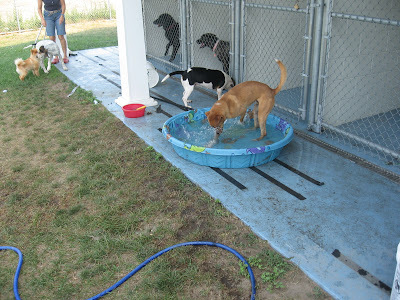 We had just let Brandy loose inside so the prospective new parents could play with him. Blue the large fox hound was outside playing with other dogs. No one noticed that his inside kennel door was ajar and when let in, he immediately saw what looked like a little fox, (Brandy). Fortunately I was close enough to jump on the hound before he could start shaking the little guy. Brandy suffered a couple of puncture wounds and bruises, but will recover nicely. The silver lining is that he was immediately adopted by the people and will be picked up at the vet as soon as he is released. I was in hospital today for exploratory surgery that went well. My buddy Brandon, who has a collapsed lung also was operated on this morning. His prognosis is for a full recovery. He got a message to me that he is going to quit smoking for sure. So I guess if your try enough things, you can all find a good smoking cessation program. Quitting smoking for so many people is like climbing a cliff. Just when they get near the top, they jump into the lake below and have to start climbing again. My only worry is that he is so young that when he recovers fully and feels good again, he may try that "one" cigarette that sends everyone back into the water. I did manage a couple of rides over the weekend. Nothing much, a ride to the beach for lunch and some light reading and there are five miles on my computer, that I cannot recall where they came from. Tomorrow when the drugs from todays surgery have worn off, I'll go for a long ride and maybe recall those ghost five miles. I really hope things get back to normal for you. It sounds like you've had a pretty dramatic/traumatic week or so. I quit smoking almost a year ago now and I'm really hoping not to fall back in the water. I still get cravings occasionally, but they are easily dealt with.